Former Trump campaign aide George Papadopoulos, whose actions triggered the Russia investigation, leaves federal court after he was sentenced to 14 days in prison on Friday. He had pleaded guilty to lying to the FBI. The operatives whom Papadopoulos met offered him "dirt" on Hillary Clinton and "off-the-record" meetings in overtures he discussed with leaders of Donald Trump's campaign. "He was unsophisticated, he was naïve and he was a fool," said attorney Thomas Breen. Papadopoulos didn't know "he was being worked by a pro"— a spy. Breen said his client "does not know if he passed it" — the offer of dirt on Hillary Clinton" — to anybody in the Trump campaign. He can guess, but he's not sure." Papadopoulos first lied to the FBI a week after Trump was inaugurated, after the president had begun to denounce "fake news" and dismiss any notion that Russia had attacked the 2016 election. So Papadopoulos followed that messaging before eventually admitting the truth to investigators, his lawyers say. Breen also pointed out the "unusual" nature of the case, describing how in one meeting with investigators at the FBI, Papadopoulos looked up to see photos of Trump and Attorney General Jeff Sessions — his former bosses on the campaign — on the wall in the waiting room. Prosecutors working for Justice Department special counsel Robert Mueller said Papadopoulos undermined their investigation and deprived them of a chance to ask a professor of diplomacy based in London how he knew Russians had obtained the "dirt" on Trump's rival, Hillary Clinton, in the form of thousands of emails. "In this case, the defendant deliberately and repeatedly lied to agents of the FBI in the course of a highly significant investigation ... He chose to lie again and again to advance his personal interests to get a high level position in the new administration," said Andrew Goldstein of the Justice Department. Ultimately, Papadopoulos was never hired for a job in the administration and Trump has distanced himself from him. But because of the lies, Goldstein said, the authorities had to "painstakingly piece together" evidence of what really happened, by reviewing 100,000 emails and electronic data. Only then could they confront Papadopoulos. The Russian outreach to Papadopoulos was part of a sweeping active measures campaign aimed at the United States and also included overtures toward other political operatives, cyberattacks and agitation on social media. Far from cooperating to energize the special counsel probe, argued prosecutors Goldstein, Jeannie Rhee and Aaron Zelinsky, Papadopoulos and his wife instead gave life to a false narrative about them and the seriousness of his offense. Papadopoulos said he realizes now that what he did was wrong. "In January 2017, I made a terrible mistake for which I have paid dearly and I am terribly ashamed," he said. "My entire life has been turned upside down." He added that he hoped to signal to other witnesses that "this investigation has global implications and the truth matters." Federal Judge Randy Moss acknowledged the time and energy this had cost the government. "It took six months before Mr. Papadopoulos corrected the record and he did so in the face of proof that he lied," he said. But the judge called the sentence he'd handed down on Friday appropriate. "Just the process of having to go to prison will have a strong impression on him for the rest of his life," he said. Papadopoulos will be allowed to surrender himself to the Bureau of Prisons once he is notified of the location where he'll be incarcerated. His lawyer said Papadopoulos and his wife want to move from their home in Chicago to Los Angeles. More than a "coffee boy"
Papadopoulos was once described as a "coffee boy" to the Trump campaign. But he attended foreign policy meetings with candidate Trump and then-Sen. Jeff Sessions, among others. His lawyers said that Papadopoulos had suggested brokering a meeting between Trump and Russian President Vladimir Putin in 2016 and that Trump "nodded with approval," according to a court filing last month. Defense lawyers Breen, Todd Pugh and Robert Stanley argued that the young energy consultant was merely "out of his depth" in dealing with the Russian operatives. Trump appeared to respond to the sentencing on Friday with a Twitter post that repeated his argument that the Russia investigation is groundless. But the top Democrat on the Senate intelligence committee, Mark Warner of Virginia, said on Friday that Papadopoulos' sentencing confirmed that Mueller's work is real and Warner said he has questions of his own for Papadopoulos. "As an influential foreign policy adviser to the Trump campaign, Mr. Papadopoulos was informed that Russia had 'dirt' on Hillary Clinton in the form of 'thousands of emails' at a critical time during the campaign," Warner said. "I still have significant questions about how high that information went, and I know the Senate intelligence committee would like to hear directly from Mr. Papadopoulos." Papadopoulos was living in London at the time he joined the Trump campaign, one of a number of advisers recruited at a time when Trump was trying to establish his bona fides and under pressure to name a team of foreign policy advisers. The FBI began investigating Russian's election interference after getting a tip that Papadopoulos had dished about his Russian connections to an Australian diplomat during a night of heavy drinking. The Australian notified his government, which notified the United States. That sparked a counterintelligence investigation that has become the ongoing effort led by former FBI Director Mueller to get to the bottom of Russia's attack on the 2016 election — and whether any Americans conspired with those efforts. Papadopoulos was the key to discovering that, the government says. "His arrest and prosecution served as a notice to all that this was a serious investigation," defense lawyers wrote. "He was the first domino, and many have fallen in behind." Today brought a milestone in the Russia investigation. 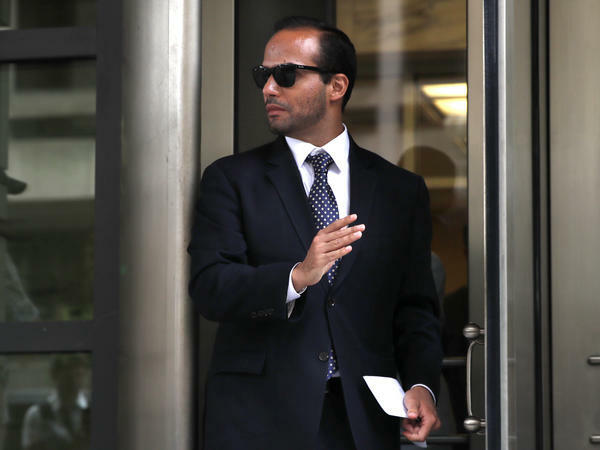 A federal judge in Washington handed down a sentence for George Papadopoulos. He was the first person to plead guilty to charges brought by special counsel Robert Mueller. That was back in October of last year. And since then, Papadopoulos has been cooperating with the government. NPR national justice correspondent Carrie Johnson was in the courtroom today for this and joins us now. Hi, Carrie. SHAPIRO: So what is Papadopoulos' punishment? JOHNSON: It's 14 days in prison. That is more than what he wanted, which is probation, but far less than the six-month maximum sentence he faced under the guidelines. The judge, Randy Moss, said he believed Papadopoulos put his self-interest before the interest of the nation. But he also said Papadopoulos seemed remorseful. He called the public shaming that Papadopoulos has experienced nearly unbearable, and he said he thought having to go to prison at all will make a strong impression on this defendant for the rest of his life. Papadopoulos for his part seemed to be pretty relieved. He'll be able to surrender on his own. He left court today with his wife and his parents. Eventually, he said, he wants to move to Los Angeles. SHAPIRO: What was the scene like in that courtroom on this momentous day? JOHNSON: Yeah, Papadopoulos was fidgeting before the hearing, playing with his fingers and his hands. His eyes looked puffy. His wife looked very nervous. He stood up in court and told the judge, I made a terrible mistake for which I have paid dearly. He said his entire life was turned upside down. He wants a second chance. But he also wants to signal to other witnesses that this investigation has global implications and that the truth matters. Now, the government team led by a veteran public corruption prosecutor named Andrew Goldstein was pretty tough in court today, Ari. They wanted to see this man get some prison time. They said he deliberately and repeatedly lied to the FBI about the investigation into Russian interference in the election. And they said he set back the investigation by not coming clean for six months. They said his motives were calculated to show loyalty to the president and position himself for a big job in the Trump administration, which of course he never got. SHAPIRO: Remind us where he fits into the larger Russia story. JOHNSON: This guy was one of a number of young junior aides brought in to the campaign when Trump was under pressure to reveal his foreign policy team. And he came to public attention by bragging about his ties to the campaign in London. He began to get offers there from Russian operatives. One of them told him he had dirt on Hillary Clinton or the Russians had dirt on Hillary Clinton. His lawyer says George Papadopoulos was simply unsophisticated, naive and foolish. He didn't realize he was getting worked by a pro, by a spy. But George Papadopoulos also said this idea of advancing relations with Russia was a true Trump campaign goal and that Donald Trump as a candidate and now-Attorney General Jeff Sessions both seemed receptive to the idea of meeting with Russians in March 2016 when Papadopoulos brought this up. Of course, Ari, one night Papadopoulos got drunk in a pub with an Australian diplomat, started blabbing all about this. The Australian told his government, which told the U.S. and thus launched this major counterintelligence investigation. SHAPIRO: So he's been cooperating with investigators as part of his plea deal. Is there any sense of what information he might have given them? JOHNSON: There is - there are some hints. His lawyer - George Papadopoulos' lawyer, Tom Breen, said he did share information about that big foreign policy meeting with candidate Trump and now-Attorney General Sessions. And the lawyer said this was an unusual case because some of the people he was dishing about in a meeting with the FBI had their photos on the wall of the FBI building. That's now-President Trump and now-Attorney General Sessions. His lawyer said that basically Papadopoulos was just parroting what President Trump said - that this investigation was a witch hunt and fake news. His lawyer said the president of the United States hindered this investigation more than George Papadopoulos ever could. The judge of course found otherwise and sentenced Papadopoulos to some prison time today. SHAPIRO: That's NPR national justice correspondent Carrie Johnson. Thanks, Carrie.